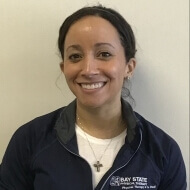 Sarah has worked for Bay State Physical Therapy for the past 10 years and is the managing partner for our Rockland office. She received her Doctorate in Physical Therapy from Northeastern University in addition to her Bachelors in Rehabilitation Science. She specializes in post surgical rehab, sports injuries, TMJ, and general orthopedic conditions including pediatrics. Sarah gained experience treating patients after total joint replacements at New England Baptist Hospital and South Shore Hospital. In addition to treating orthopedic and sports related injuries at two outpatient orthopedic clinics. Sarah has also worked with infants and toddlers from 0-3 with gross motor developmental delays. Through continuing education courses, Sarah has expansive knowledge of manual therapy techniques and therapeutic exercise intervention regarding shoulder mechanics, hip and lower extremity dysfunction, and spine conditions. Her main focus is to work with patients on an individual level to help reach their goals and maximize function. Sarah enjoys staying active by working out and participating in yoga.